A hacking incident happened in Facebook. Tech giant Facebook has confirmed that there was a breach to at least 50 million Facebook accounts due to some extensive hacking activities. The hackers exploited a Facebook feature to gain access to account digital keys. One can use these digital keys to access user accounts. We suggest that you perform these suggestions to protect your Facebook account from the hacking incident. For the longest time, Facebook has dedicated a considerable amount of their resources on security and privacy. Amidst the Cambridge Analytica scandal earlier this year, Mark made a post that Facebook has the responsibility to protect user data and that if it fails to do it, then it does not deserve to serve its users. Now, Mark’s statement is in scrutiny after the largest breach in the companies 14-year history. The breach is an alarming issue. If you care about your Facebook privacy, then you need to protect your Facebook account. 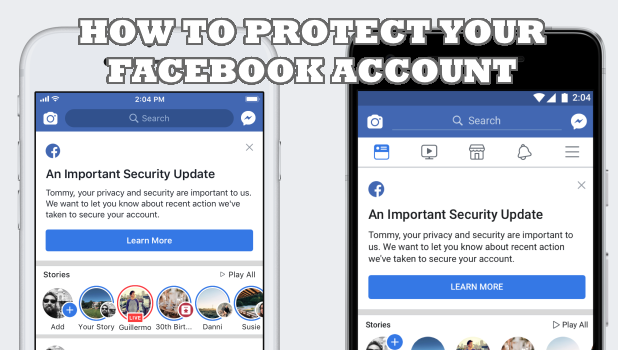 Learn how to protect your Facebook account by following the steps in the next sections. To ensure that your account is protected from being hacked and exposure of data, you need to do 4 important things – change your password, log out of all devices, review your recent logins, and enable 2-factor authentication. All of these for methods are discussed in the next sections. Regularly changing your passwords is a good way to ensure the security of your online account. Whether you are on Facebook, Twitter, and other online accounts, having different and unique passwords at least every 6 months is one good way of keeping your online accounts safe. To change your Facebook password, go to Home > Menu > Settings > Security and Login > Change Password > Enter your current password and your new password > Save Changes. You can check our detailed article on how to change your Facebook account password. Facebook keeps track of your recent logins. Facebook saves the devices used, locations, and the times of recent logins for you to audit. Go over your recent Facebook logins and check on the logs of your logins. A login from an unknown device or unvisited place may mean that someone has access to your account. Once compromised, immediately change your password and other personal information. To review your recent logins on Facebook go to Home > Menu > Settings > Security and Login > Click on the See More Option on Where You’re Logged In. You can also check our detailed article on how to review your recent logins on Facebook. To log out of all active Facebook sessions, go to Home > Menu > Settings > Security and Login > Click on the See More Option on Where You’re Logged In > Scroll down to the bottom part > Tap on the Log Out of All Sessions button and confirm the action. You can use our detailed guide on how to view active Facebook sessions and end them. Two-Factor authentication adds a layer of security to your Facebook account. With Two-Factor authentication, having a password is not enough. A hacker needs another set of authorization to successfully log into an account. There are different Two-Factor authentication methods available. To enable two-factor authentication on your Facebook account, go to Home > Menu > Settings > Security and Login > Use Two-Factor authentication > Select your preferred authentication methods. You may check out our article on using Facebook’s Two-Factor authentication for a detailed step-by-step procedure. You just learned how to protect your Facebook account. Do you have any questions about any of the information presented? Do you have your own Facebook account safety tips? We would love to hear them in the comments section.